Is Feeding Oats To Horses For Weight Gain A Good Idea? Oats are a traditional mainstay in horse feeding. They are often thought of as a safe grain and frequently make up the basis of a horse’s grain diet. In reality, there are upsides and downsides to feeding oats. Is feeding oats to horses for weight gain a good thing? In this article, we explore the nutritional makeup of this traditional grain and provide sound advice on how, when and why it should be fed – or not. Read on to learn more. 2.1 Can I Feed My Horse Oats? 4 How Can You Help Your Horse Gain Weight? Because of this, nutritional content of oats can vary as much as 15% from one batch to the next. Horses require calcium and phosphorus in balanced amounts for good health. Oats contain these minerals in varying degrees; however, usually this grain contains a great deal more phosphorus than calcium. Starch metabolizes as sugar, and this can be very detrimental to horses with Cushings syndrome or other metabolic complications. Oats have been traditionally considered a low starch choice in grains; however, this grain is really only low starch when compared with corn. Oats typically contain between 32 and 43 percent starch. On the upside, that starch is more digestible than the starch found in other types of grain. If you are feeding oats for weight gain, this can be a good thing. If you are feeding to prevent metabolic problems, you are better off with a prepared low-starch feed containing between 11 and 14 percent starch. Amino acids (e.g. threonine, methionine and lysine) are “protein building blocks”. For weight gain, a high level of amino acid content is necessary. Oats do contain amino acids, but levels vary from one batch of oats to the next, and the levels are not impressively high under any circumstances. Clearly, there are many variables to consider when feeding your horse oats. A diet of oats alone would not be sufficient for any horse, and as a weight gain supplement oats are definitely lacking. Can I Feed My Horse Oats? The digestibility of oats also varies greatly depending both on the quality of the grain and its processing. Whole, rolled oats are definitely the least digestible. This grain can be crushed, crimped or de-hulled to increase digestibility. Even so, you are sure to find lots of undigested oats in your horse’s manure. This means the grain has simply passed through your horse’s system as roughage without providing any nutrients. Problems can arise when the undigested starches in the oats reach the hindgut where the starch begins to ferment. This process produces a great deal of lactic acid, which interferes with the work of beneficial microbes – the breakdown of fiber. This interference lowers the pH level of the hindgut by increasing acidity. How Can You Help Your Horse Gain Weight? Consult with your vet to find a high quality complete feed that is appropriate to your horse. These feeds are specially prepared to provide balanced nutrients in an easily digestible form. Many contain oats that have been processed in a way that makes their nutrients more easily available to horses. Feed small meals multiple times daily. 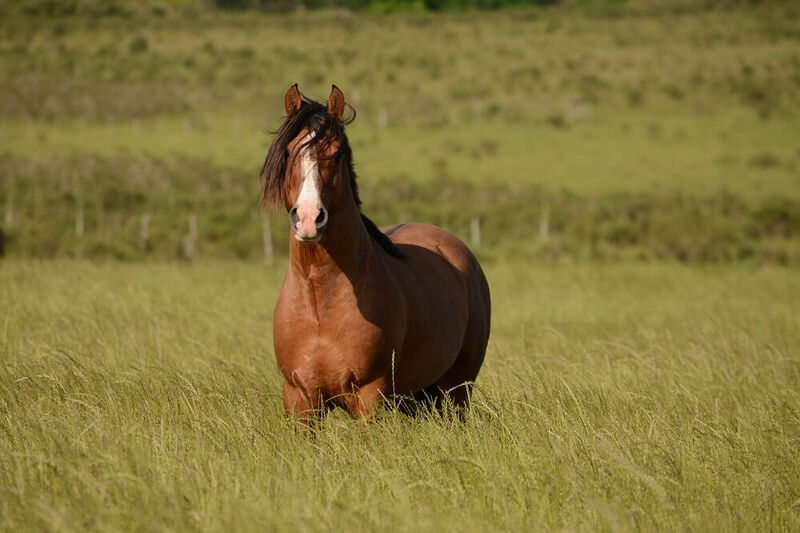 Give your horse free access to pasture and high quality hay 24/7. Increase forage and frequency of meals, not the amount of grain you are feeding. Too much grain or complete feed can disrupt a horse’s digestive system and work against weight gain. Patiently supplying a balanced diet is the best way to help your horse gain weight gradually. With specially prepared, complete weight gain feeds the stomach breaks down food to be absorbed. It does not break down roughage or fiber (e.g. beet pulp, hay, grass). Nutrients are absorbed from the food in the small intestine. Fiber slows down the digestive process. If you only feed a large meal of processed feed or complete feed once or twice a day, these meals will move through the stomach and the small intestine quickly and will be broken down and absorbed completely before reaching the hindgut. This can disrupt acidity levels in the hindgut. This is why feeding large amounts of concentrates all at once is counterproductive. Doing so creates a situation in which the nutrients and calories in the feed cannot be absorbed by the body. Furthermore, this situation can damage the function and structure of your horses gastrointestinal tract. Finally, lowered pH levels in the hindgut can adversely affect your horse’s energy and performance levels as well as his overall health. 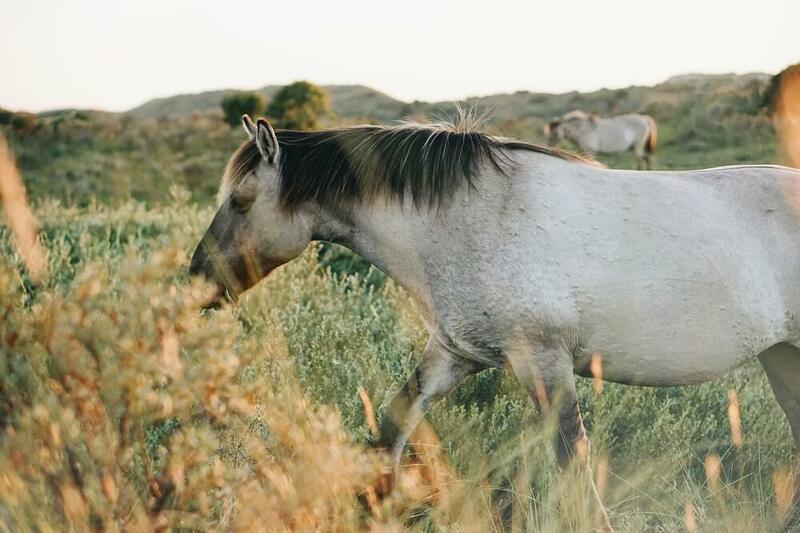 The bottom line is, you should work closely with your vet to determine just the right diet to help your horse gain and maintain the correct weight. Trial and error, hit and miss and guesswork can be costly and very detrimental to your horse’s health.